What is a USDA Guaranteed Home Loan? What is an Interest-Only Mortgage? What is an Interest Rate Reduction Refinance Loan? What is a Home Equity Conversion Mortgage? What is the Difference Between a Fixed Rate Mortgage and an Adjustable Rate Mortgage? 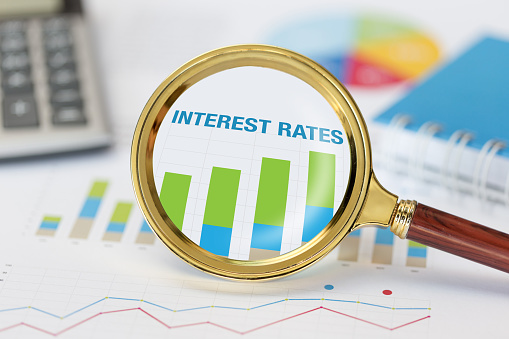 What Does Rising Interest Rates Really Mean? What is the Dodd-Frank Act? What is the Difference Between a Reverse Mortgage and a Cash Out Refinance? Why are Interest Rates So Important? Why Should I Refinance My Home? What Could Trump’s Tariffs Mean For Housing? Are We Headed For Another Recession? What is an Escrow Account? Who Decides the Interest Rates? Should I See My Bank or Go With an Online Lender? Should I Continue Renting or Buy a Home? So You've Decided To Buy A Home, What Happens Now? Equity: Should I Sell My Home or Cash Out Refi? How Can You Get Cash From Your Home? What Questions Should You Ask Your Lender? It seems like a 30 year fixed mortgage is the golden standard of mortgages even though there are different types of mortgages out there to suit everyone’s different needs and preferences. Financially speaking, it might be the best option for first time home buyers because of the low monthly payments and the fixed interest rate, but with so many different options out there how can you be so confident that this is the right product for you? Why Is The 30-Year The Most Popular Choice? Let’s start with the basics. With a 30 year fixed you have a fixed interest rate and you have 30 years to pay off your mortgage, which are the two biggest benefits that come with this type of mortgage. When thinking about the pros and cons that come with a 30 year fixed mortgage, the cons definitely outweigh the pros on paper. In fact, with a 30 year fixed mortgage there are 2 major pros: you get to have a low monthly payment and the interest rate is fixed. Even though a 30 year fixed really only offers the home buyer a low monthly payment, it is one of the most important things to consider when purchasing a home. What Is The Difference Between a 15 Year and 30 Year Fixed? Between a 15 and a 30 year fixed, there is a huge difference between the two. With a 15 year fixed, the home buyer will get a lower interest rate which equates to a lower amount to pay back and in conclusion, the home is fully paid off in only 15 years. The downside however, is that there is a higher monthly payment. With a 30 year fixed, the situation is the exact opposite. 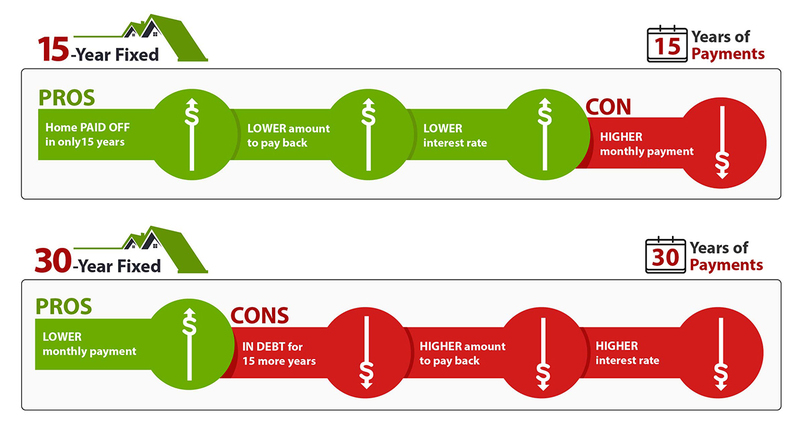 The borrower will get a higher interest rate which means they will have a higher amount to pay back, and they will also be in debt for an additional 15 years than if they were to have opted for a 15 year fixed. Why Is Interest Rate Is So Important? To make the concept of interest rates easier to understand, let’s say that the amount borrowed is $200,000. Let’s also pretend that the interest rate for a 15 year fixed mortgage is 3% and the interest rate for a 30 year fixed mortgage is 5%. For a 15 year, the interest is $6,000 and brings the total amount owed to $206,000. $206,000 divided into 15 years of payments brings the monthly mortgage payment to $1,144.45. Now, for a 30 year the 5% interest brings the total amount owed to $210,000 and the monthly mortgage payment is calculated to only $583,34. While the monthly mortgage payment amount for a 30 year fixed is much lower than that of a 15 year fixed, overall you will be paying more for a 30 year mortgage because you will be making those payments for twice as long. While all of this information may sound discouraging, you have to consider your quality of life and how it will be affected. Everyone’s situation is different and maybe having a 15 year fixed is not ideal even if the borrower is able to afford a higher monthly payment. Having a 30 year fixed gives the borrower a low monthly payment, which also gives the borrower more financial breathing room every month and the opportunity to put aside some money now instead of putting away more money after the mortgage has been paid off. Who Is The Perfect Candidate For a 30 Year Fixed? First time home buyers are a great candidate for a 30 year fixed because of the low monthly payment. Going into a new lifestyle where you have a greater sense of financial responsibility means that you need to be prepared for all of the hurdles that come with it. Owning your own home means that you are responsible for all the remodeling, the repairs, Homeowners Association fees (if you buy a condo) and the maintenance that automatically comes with it. You are not going to have a property manager that will take care of these things for you anymore, so it is advised to put some money aside so that you will be financially prepared to take care of any surprises or mishaps that come along the way. Having a low monthly payment will better allow you to prepare yourself for any instances that will require your immediate attention and your wallet. Another great perk that comes with having a 30 year fixed is the fixed interest rate, meaning that the interest rate stays the same throughout the entire duration of your loan. There are Adjustable Rate Mortgages (ARMs) that can offer you a lower monthly payment amount, but that offer only stands for a specific amount of years called the “initial period” and only lasts a handful of years. Once the initial period is over, the interest rate will adjust once a year and match itself to the market. With a fixed interest rate for 30 years, you know exactly what your monthly mortgage payment amount will be from day one. You do not have to worry about the payment amount fluctuating and getting hit with a “surprise” that you were not prepared for. The interest you pay on your mortgage is also tax deductible, so with a 30 year fixed you can write off a larger dollar amount since the interest associated with a 30 year is more than other mortgages. You are, however, limited to deducting on your first $500 thousand in debt. While it is a deduction and not a tax credit, meaning that if you pay $10,000 in interest you won’t be getting $10,000 deducted from how much you owe, you can significantly reduce your taxable income. If you are in a 25 percent tax bracket, you will instead reduce your taxes by $2,500 because 25 percent of $10,000 is $2,500. What If I No Longer Want To Be In a 30 Year Fixed? If you feel that you want get out of your 30 Year because you want to pay less in interest and save money on the overall cost of your loan, you are more than welcome to refinance into a different mortgage that could be the new best option for you. As time goes by, circumstances change and maybe you earned a promotion and a raise that can afford a higher monthly payment while enjoying life. It is definitely possible that a 30 year mortgage is no longer your best financial option and the best part is that you aren’t obligated to stick by your mortgage until the end of its term. If you have increased your income, but are hesitant to jump the gun and commit to refinancing, you can also stay in your current mortgage and increase what you pay monthly. Like a credit card, your monthly mortgage payment is a minimum payment that is due in order to pay off your mortgage in exactly 30 years. You can opt to pay more each month without having to go through the process of refinancing into a different type of loan and pay off your loan at a faster pace. You can even make double payments if you want to pay what is due each month and contribute a little more if you find that you have some disposable income that month. If you sit down and think about it, being able to claim all of those benefits with a 15 year fixed possibly means that every spare dime you have will go towards your monthly mortgage payment. You might have to cut down on socializing and grabbing dinner with your friends and there is a chance that you might not be able to take a vacation for a long time. If this is something that you do not want for yourself, then a 30 year fixed mortgage is the right choice for you. While some people are ambitious and are focused on paying off debt as quickly as they humanly can, it is not the right choice for everybody, even if on paper it is the right choice. As life goes on and you increase your earning potential and eventually increase your income, you can switch to a different type of mortgage that’s better suited to help you reach your financial goals or you can stay in your current mortgage and increase your monthly payment amount. In the end, you are the one to decide the terms of your mortgage and your life so choose what fits you and your lifestyle the best. Calculate your monthly payment, interest, APR, and total interest paid using our simple and easy-to-use mortgage calculator. Use our Refinance Calculator to see different financial opportunities that could help you lower your monthly payment or save money. Select different mortgages and see all the different benefits that each mortgage provides in one easy-to-read infographic. From the provided information, we analyze your current mortgage and tell you if it is either helping or hurting you. We direct you to the best mortgage for your current financial and life situation, based on the provided information. LowerMyBills does not endorse, warrant, or guarantee any mortgage product, service or company and makes no representation of any rates or financial programs. The data displayed in the rate table does not take into consideration your personal financial situation, verified credit score, income, existing debt, or other factors. Actual rates and payment information will vary based on your specific situation. Recommendations are based on products and services available from lenders participating on our network or in the marketplace generally, however it does not represent every financial services company or financial product or service available on the market. LowerMyBills is not a mortgage broker or lender. The information provided by you to LowerMyBills is not an application for a mortgage, nor is it used to pre-qualify you with any lender.